Overall national waiting lists for hospital care continue to rise and there are now more than 689,700 patients waiting for treatment or to be seen by a consultant. The figures for December are up by around 4,800 patients, compared to the 684,900 national total for the previous month. More than 500,800 were waiting to be seen by a consultant at an outpatient clinic. The figures are from the National Treatment Purchase Fund. Of those waiting to be seen or treated, 98,067 were waiting for inpatient or day case treatment. There were 26,139 waiting for a gastrointestinal check. A further 64,770 people are scheduled for follow-up care soon having already had initial treatment. Minister for Health Simon Harris said the budget for the NTPF and waiting lists had dramatically increased, saying he expects to see good progress in driving down waiting lists heading into the spring. He said the number of patients waiting more than 12 months was lower in December, than at any point in 2017 and there were also decreases in a number of specialties, including cataract surgery, ENT, urology and scopes. But Mr Harris said that outpatients remains a big challenge. He said that last year almost half a million people (479,000) did not attend their outpatient appointment. 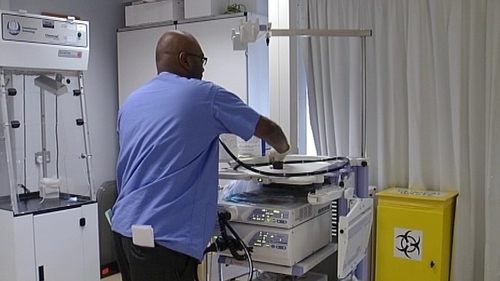 Elsewhere, there are 473 people waiting on trolleys in emergency departments, or on wards, waiting admission to a hospital bed, according to the Irish Nurses and Midwives Organisation. This is down from a figure of 544 recorded yesterday morning by the INMO. The worst affected hospital today is University Hospital Limerick with 48 patients waiting. There are 30 patients waiting at University Hospital Galway, 25 at University Hospital Waterford and 24 at Our Lady of Lourdes Drogheda.